Forrester surveyed over 380 CxO’s and Functional Heads across our core verticals (Telco/FS & Banking/Retail) to produce the report entitled ‘Winning in the Customer Era’. 73% of firms believe that traditional business models will disappear in the next 5 years due to the digital revolution. Digital disruption will change business models rapidly: delivering great customer experience, while navigating huge volumes of data, agile and disruptive competitors and fighting increasingly sophisticated fraud are some of the key business challenges that organizations face today. Discuss exclusively with other Austrian C-Level deciders, the challenges, and trends and benefit from getting insights into successful concepts. 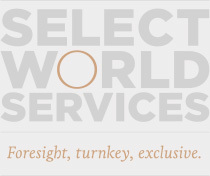 JOIN US for senior-level conversations, exchange of ideas and networking at Select World Services’ Exclusive, intimate, by invitation only CXO dinner – Digitization – Drive or get Driven? And VPs, Head of Departments with responsibilities in Digitization, IT, Data, Innovation, Fraud, Risk and Finance.